The Graduate Management Admission Test (GMAT) is a computer-based test conducted by the Graduate Management Admission Council (also referred as GMAC). It intends to assess certain skills of a candidate, including; analytical writing assessment, integrated reasoning ability, quantitative, and verbal ability. The assessment so made is used for admission to graduate programs around the world and the most popular among them is Masters in Business Administration (MBA). Students from different background aspire to get admission in top business schools of the world. GMAT is the first step on the way. Best applicants are chosen on the basis of their scores. Therefore, the system for selection of students is made in a transparent manner. This article describes in detail about the GMAT exam pattern and GMAT exam syllabus. The GMAT exam pattern comprises of the following: four sections – Analytical Writing Assessment, Integrated Reasoning, Quantitative, and Verbal. At the test center, just before the exam begins, candidates can select the order in which they want to complete the sections. Candidates can check different segments along with some example questions and important subjects in this article. Below provided is the GMAT Exam Pattern in detail. The GMAT exam syllabus and pattern comprises of the following four sections. The details of the GMAT exam syllabus are provided below. Look at and analyse the given argument. Make sense of out the reasoning behind an argument and compose a critique of the same. Work out a methodical way to deal with present your answer. Support your answer with proper examples and clarification. Make certain of the correct sentence structure utilization while introducing your answer. The scores for this section are on a six point scale. Your essay is given two independent ratings and then an average is considered. 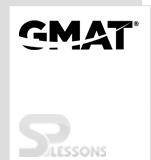 This new section of the GMAT was introduced in June 2012. It has 12 questions with 30 minutes to answer this section. The score is on a scale of 1 to 8. This section tests how well you can make utilization of your analytical skills to solve a complicated problem. You are provided with utilization in different forms. Your skill depends on being able to handle the data, select the information that is applicable and then choose the correct answer. In each question, you are expected to provide multiple answers from the choice provided. Table Analysis: In this, you are given a lot of data in a table format. The question asked that expects you choose answers from yes/no, true/false with multiple statements to answer under each question. Graphics Interpretation: In this sort, you are given a diagram or a graphical picture. You’re relied upon to interpret the graph and complete the statements given by picking one of the alternatives starting from the pull menu. Multi-Source Reasoning: Here you need to gather data by clicking on the different tabs (2-3) provided. The data available may be presented either as text or in the form of charts, tables. The appropriate answers may be in the yes/no, true/false format or as multiple choice options. Two-Part Analysis: You have a question and multiple choices provided. The appropriate answers in a table form have the two components occupying the first two columns and the answer options in the third column. Of all the options provided, you have to choose only one option under every component to complete one answer. Critical reasoning questions test your ability to examine logical arguments. The contentions cover a scope of points and circumstances which normal GMAT-takers would be relied upon to have the capacity to see, even if they are not very familiar with the subject area candidates can complete this section very comfortable. 2. Take a couple of additional seconds to ensure you understand the conclusion of the argument. All sentence correction questions comprise of a sentence with part underlined, followed by 5 answer choices. Your task is to pick the BEST form from the choices given. Sentence correction questions test your knowledge of standard written (American) English. 1. Read the sentence carefully and try to spot an error. 3. Go through the remaining choices to find a second error and fix that. 4. If you cannot find an error consider option A. 5. Finally read the whole sentence with the option you are selecting in place.